Frederick Marryat served well in the British navy and wrote prolifically about the sea. He also wrote horror stories, including "The Story of the Greek Slave" and "The Legend of Bell Rock." Marryat's weird novels included The Phantom Ship (1839) and Snarleyyow, or The Dog Fiend (1837). 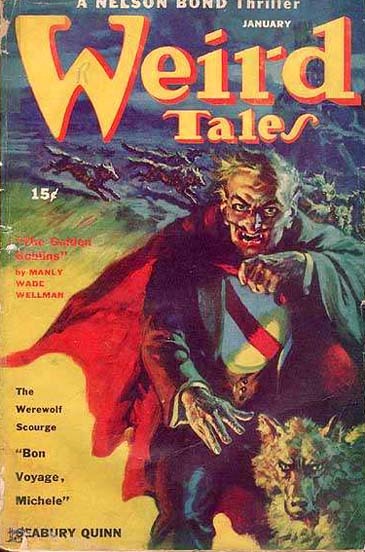 Weird Tales reprinted his story "The Werewolf," in its May 1926 issue. 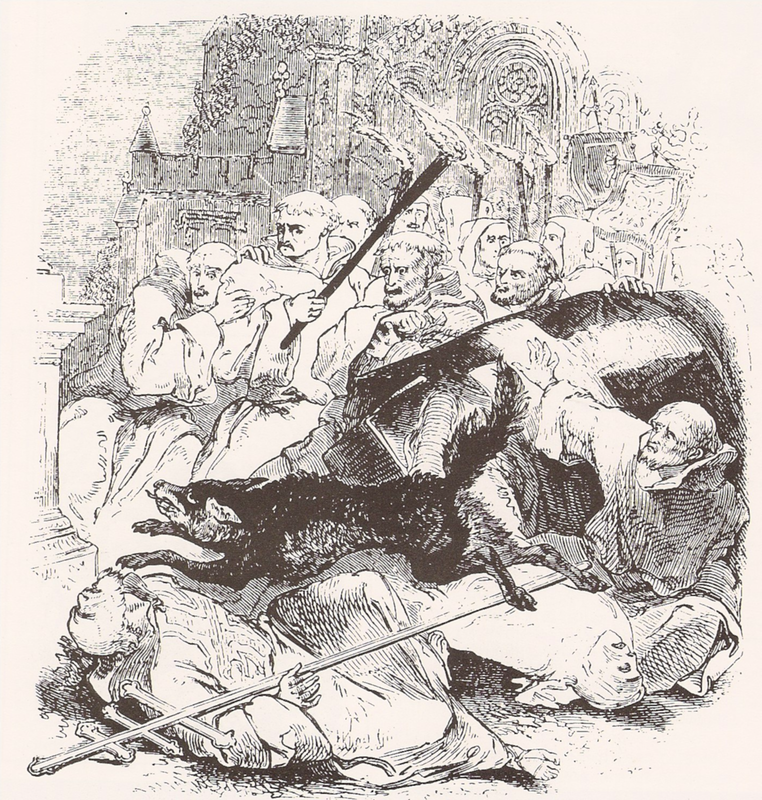 I believe the story was retitled after the original, "The White Wolf of the Hartz Mountains," drawn from the novel The Phantom Ship, and originally published in The New Monthly Magazine in 1839. Elizabeth Gaskell, friend and associate of Charles Dickens, Charlotte Brontë, Charles Eliot Norton, and other prominent people of her age, was a successful and well-loved author despite her short life. With Dickens, Wilkie Collins (see below), and three others, she wrote "The Haunted House," a collection of interconnected stories set in a haunted house. "Conducted by" Dickens (who also wrote the first and last installments and one in between), the story was published in All the Year Round in 1859. Mrs. Gaskell's contribution to Weird Tales was "The Old Nurse's Story" from October 1927. Author of more than three dozen volumes of drama, fiction, and non-fiction, Wilkie Collins is remembered now for his mystery and detective novels, especially The Woman in White (1860) and The Moonstone (1868). Collins contributed to Dickens' collection of ghost stories, "The Haunted House." (See Elizabeth Gaskell above.) "The Dream Woman," from The Frozen Deep and Other Stories (1874) appeared in Weird Tales in January 1927. Weird Tales reprinted his poem "A King in Babylon" in its December 1929 issue. Playwright, novelist, poet, reviewer, and translator Ernest Dowson lived a short life of tragedy and dissipation, yet through his work, his name will live on, for his poetry gave us the phrases "Gone with the Wind" and "Days of Wine and Roses." 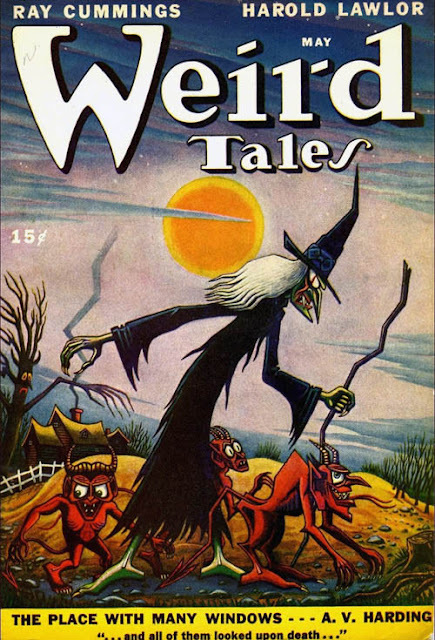 Weird Tales did its part to remember him with two poems reprinted, "A Requiem" (March 1927) and "The Three Witches" (February 1928). 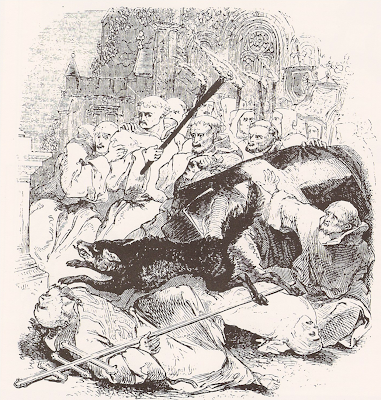 An illustration of a werewolf by Henry Anelay, probably from the 19th century. 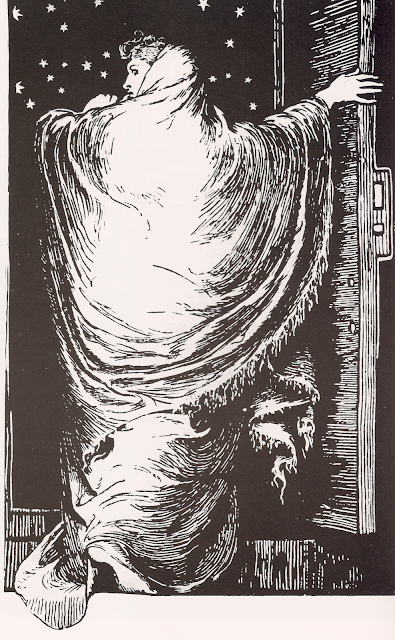 And an illustration for The Woman in White by Wilkie Collins. The artist was Frederick Walker. Bulwer-Lytton worked in a number of forms and genres, including the horror story and the science fiction novel. Weird Tales reprinted "The Haunted and the Haunters, or The House and the Brain" (1859) in a very early issue of the magazine, May 1923. Equally interesting is his authorship of The Coming Race, or Vril: The Power of the Coming Race (1871), a science fiction novel concerning a subterranean race and its designs on the surface upon which we live. Theories of a hollow earth preceded the publication of Bulwer-Lytton's book. Edgar Rice Burroughs was among later popularizers of the idea. In the 1940s, Richard S. Shaver and science fiction editor Raymond A. Palmer advanced the idea that Deros, or detrimental robots, inhabit the inner earth and are forever scheming against humanity. Briefly popular, "The Shaver Mystery" faded from the public eye to be replaced by the first of two great science fiction-based belief systems, flying saucers. Raymond Palmer was instrumental in keeping flying saucers before the public for years after the first sighting in 1947. Occultists now weave the hollow earth theory, subterranean races, flying saucers, ancient astronauts, interdimensional travel, and cryptozoological creatures into a unified field theory of the paranormal. Tennyson was and is one of the most admired and accomplished poets in the English language. He served as Poet Laureate of the United Kingdom from 1850 until his death in 1892, the longest tenure of any poet to hold the post. Frequently quoted, Tennyson's verse dealt with classical, historical, and contemporary subjects. Tennyson's short poem, "The Eagle: A Fragment" (1851), brings to mind Andrew Brosnatch's drawing for "The Eyrie," the letters column of Weird Tales from 1924 to 1954. Edward FitzGerald was vastly wealthy and towards the end of his life a skeptic, yet he lived here and there and was buried in a churchyard. A dilettante, a gardener, an idler, and a writer of letters, he produced a translation of 700-year-old Persian poetry that is still read today. Weird Tales reprinted three stanzas from that work, "The Rubaiyat of Omar Khayyam," in 1934 (No. 24), 1939 (No. 68), and 1940 (No. 31). In his lifetime, Charles Dickens was probably the most famous and popular writer in the English language. In addition to his many well-read and often-filmed novels A Tale of Two Cities (1859), Great Expectations (1861), David Copperfield (1849-1850), and The Adventures of Oliver Twist (1837-1839), Dickens wrote the most famous ghost story in the English language, A Christmas Carol (1843). Weird Tales reprinted three of his short pieces, "The Bagman's Story" (Oct. 1926), "The Signal-Man" (Apr. 1930), and "A Child's Dream of a Star" (July 1930). Dickens would not have been a stranger to magazines: during his lifetime, he serialized many of his novels in monthly and weekly publications, his installments often ending in a cliffhanger. Charles Kingsley was a minister and son of a minister, and a writer and both brother and father of writers. He authored more than thirty-five books of non-fiction, sermons, verse, and fiction, most famously The Water-Babies, A Fairy Tale for a Land Baby (1863) and Westward, Ho! (1855), which lent its title to the only town in England with an exclamation point in its name. His work reprinted in Weird Tales consisted of a single poem, "The Sands of Dee," from January 1926. Dante Gabriel Rossetti championed FitzGerald's "Rubaiyat" and helped the older poet earn later printings of his work. Rossetti was the son of Italian immigrants and only one of a talented and accomplished family that included the poet Christina Rossetti. A medievalist, artist, poet, and translator, Dante Gabriel Rossetti co-founded the Pre-Raphaelite Brotherhood. Among his associates were William Holman Hunt, John Everett Millais, and William Morris, a multitalented author, artist, designer, and--as a fantasist--an influence upon writers of the twentieth century, especially J.R.R. Tolkein. Robert Louis Stevenson wrote what you might call genre fiction, or what in the 1920s and '30s could have been called pulp fiction, including pirate stories (Treasure Island), historical adventure (The Black Arrow, Kidnapped, The Master of Ballantrae), Ruritanian romance (Prince Otto), and of course horror (The Strange Case of Doctor Jekyll and Mister Hyde). Weird Tales reprinted his story "Markheim" (1887) in its April 1927 issue. 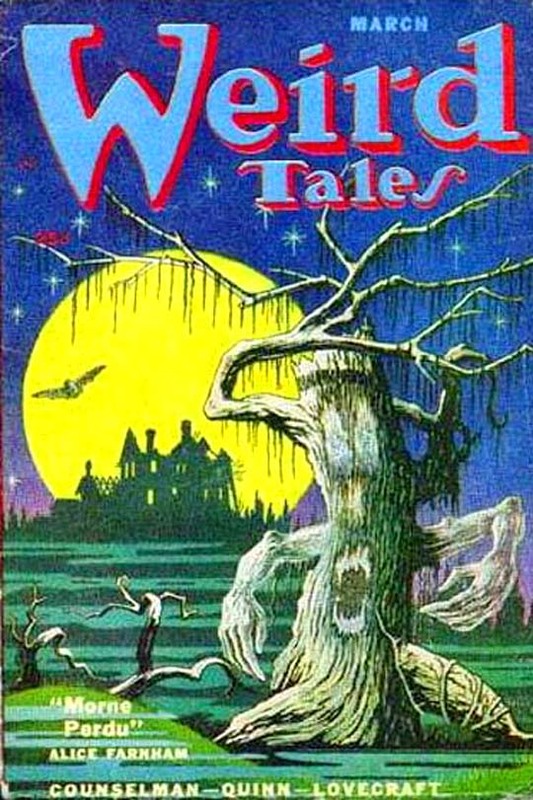 Weird Tales reprinted the work of other writers from the Victorian Age, but I'll write about them in future postings, either because they lived into subsequent ages (Bram Stoker, H.G. Wells), or because they were Irish rather than British (Oscar Wilde, Fitz-James O'Brien). 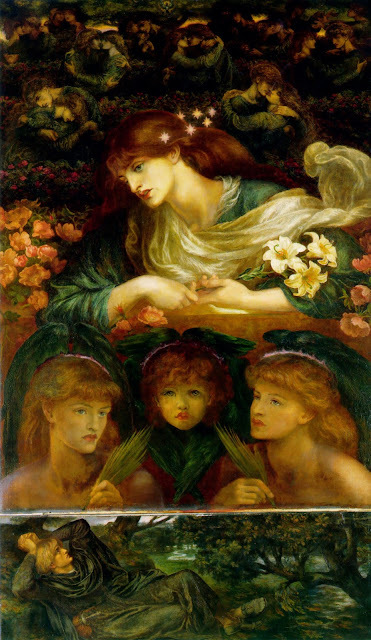 "The Blessed Damozel" by Dante Gabriel Rossetti, poet, artist, and co-founder of the Pre-Raphaelite Brotherhood. "La Belle Dame Sans Merci," another work by Rossetti and subject of Keats' poem, listed in yesterday's posting. 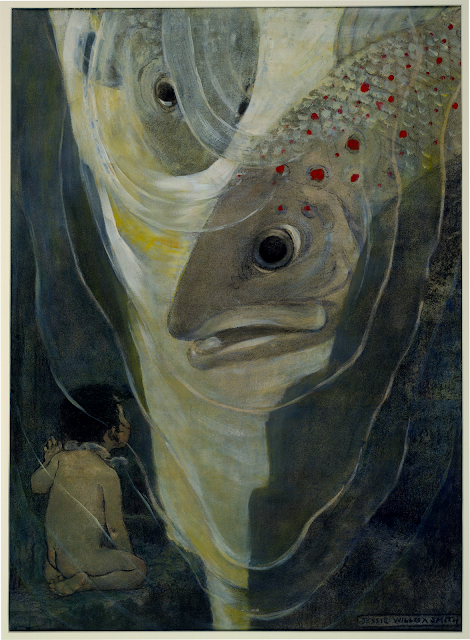 An illustration for Charles Kingsley's Water Babies by the American illustrator Jessie Willcox Smith (1863-1935). Other artists have tried their hands at Kingsley's book, but none is as closely identified with the book as she. Despite many differences among them, Wordsworth, Coleridge, Blake, Byron, Shelley, Keats, and their contemporaries were long ago lumped into a Romantic movement said to have begun in 1798 with the publication of Lyrical Ballads. The authors of that book were an anonymous Wordsworth and Coleridge. 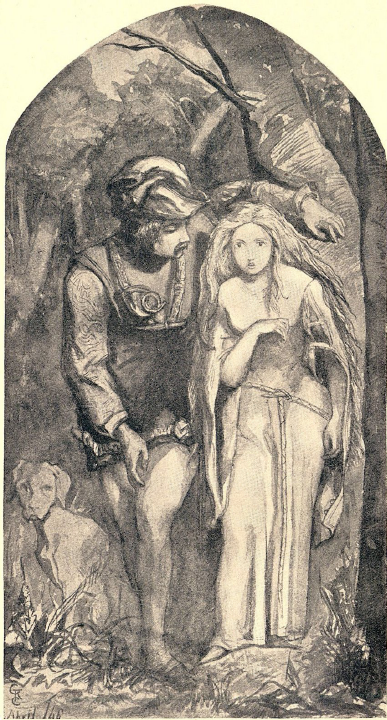 According to the Norton Anthology of English Literature, the Romantic movement was characterized by: 1) an emphasis on poetry and the poet; 2) poetic freedom and spontaneity; 3) treatments of nature; 4) "the glorification of the commonplace"; and 5) for readers of weird tales, an interest in the supernatural and "'strangeness in beauty'." Many Romantics also seemed preoccupied with death, none so much as Thomas Lovell Beddoes, who could almost have been a living Dr. Frankenstein. Beddoes, along with Keats and Shelley, also met tragic deaths when quite young and when living on the Continent. As forerunners to American literature of the nineteenth century, the writers of the British Romantic era, especially Mary Wollstonecraft Shelley with her Frankenstein (1818), might even be said to have fathered (or mothered) the weird tale. Swung blind and blackening in the moonless air. . . .
William Hope Hodgson may have drawn inspiration from Byron's "Darkness" while writing his novel from a century later, The Night Land. On the other hand, a world that ends in darkness is likely a shared vision among humanity. Miscellany: Blake's short poem "The Tyger" (1790-1792) is a work not forgotten by those who read it. Alfred Bester borrowed the first two words of the poem--Tiger! Tiger!--for the title of the British edition of his science fictional and typographic tour de force, The Stars My Destination (1956), an equally unforgettable work. 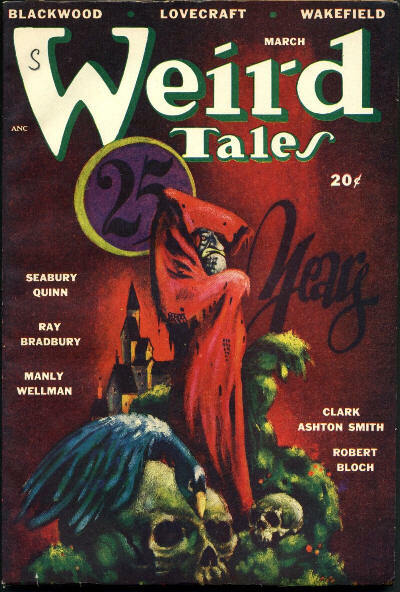 Shelley's "Ozymandias" was reprinted in Weird Tales in its September 1926 issue, about the time H.P. Lovecraft was working on "The Call of Cthulhu." As I wrote in a previous posting, in Watchmen, Alan Moore named his Übermensch character Ozymandias. What's the connection? Moore's Ozymandias uses a Cthulhu-like creature to destroy New York City. There were of course other British writers of the the Romantic era. Charles Lamb (1775-1834) wrote an essay, "Witches and Other Night Fears" (1821), that might be of interest to readers of weird tales. William Blake was not only a poet but also an artist. Here is a watercolor illustration, "The Great Red Dragon and the Woman Clothed in Sun," one of a series depicting scenes from Revelation. 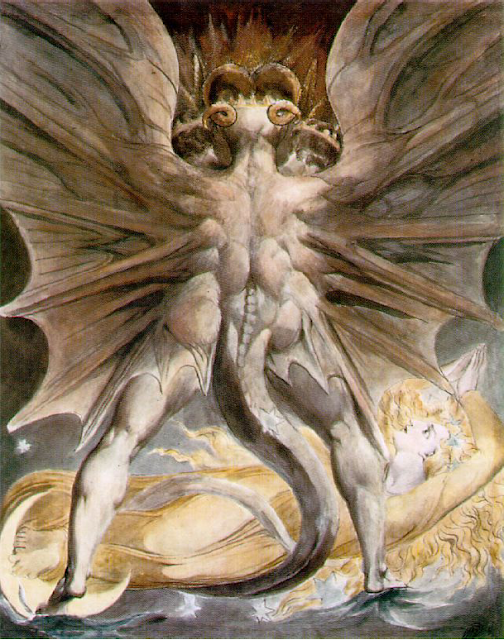 The musculature and the staves of the dragon's wings are horrifying in Blake's carefully wrought and naturalistic treatment. What model did he use to draw such a thing? What is the source for such "fearful symmetry"? 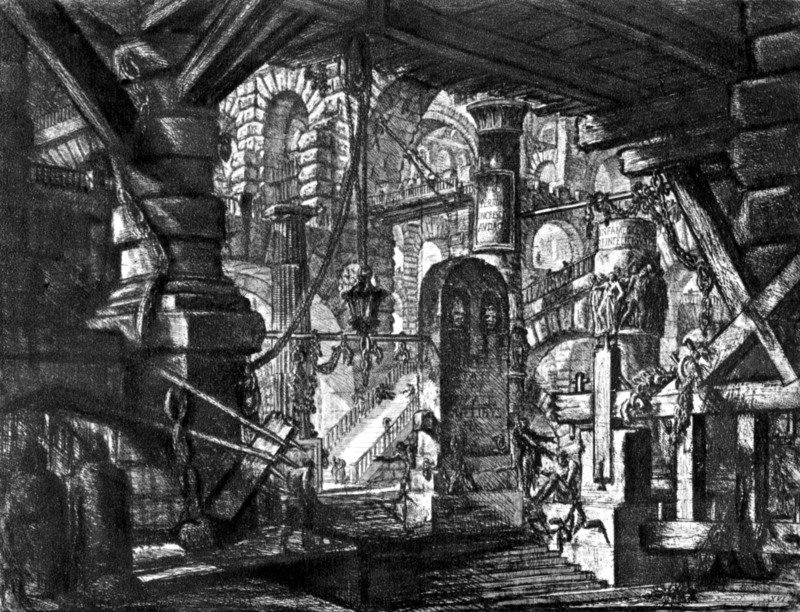 An etching by Piranesi (1720-1778), another fantasist of the 18th century. 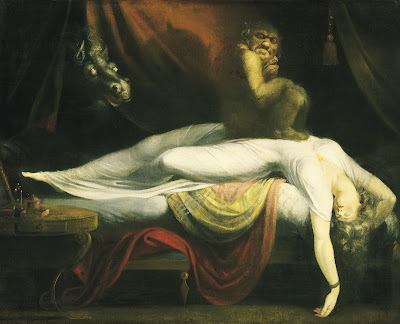 And a painting by Fuseli (1741-1825), an associate of Mary Wollstonecraft (mother of Mary W. Shelley) and an influence on William Blake. 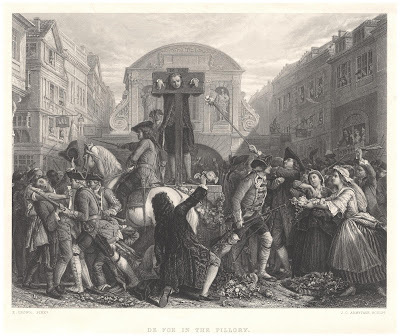 Weird tales and fantasy art go back millenia, but they began to look more modern during the eighteenth century. 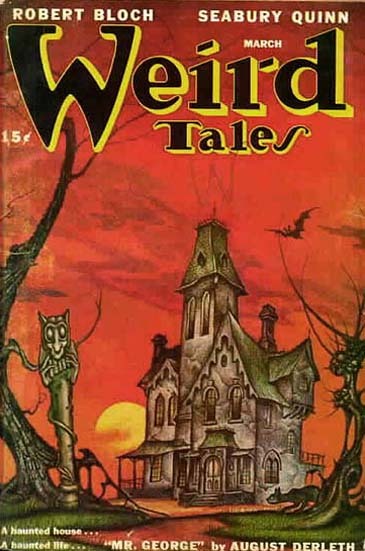 Weird Tales published many works from authors well known but long dead. It doesn't really matter that the practice might look to us like an attempt to lend an air of high culture to the magazine or an avoidance of paying authors for their work. I'm more inclined to think that if it qualified as a weird tale, it was fitting for the magazine. 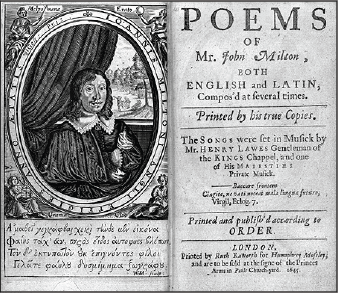 In any case, from that apparently unnamed period in English history between the end of the Renaissance and the beginning of the Age of Reason (or the Industrial Revolution) comes the work of Milton and Defoe. Defoe's story is either a journalistic account or a well-disguised work of fiction detailing the apparition of a departed Mrs. Veal before one of her friends. The full title of the work is "A Relation of the Apparition of Mrs. Veal," and it was perhaps drawn from The Novels and Miscellaneous Works of Daniel De Foe, volume 5, edited by Sir Walter Scott (Oxford, 1840). I don't know the date of the original composition or publication of the story, but the apparation is said to have taken place on September 8, 1705. 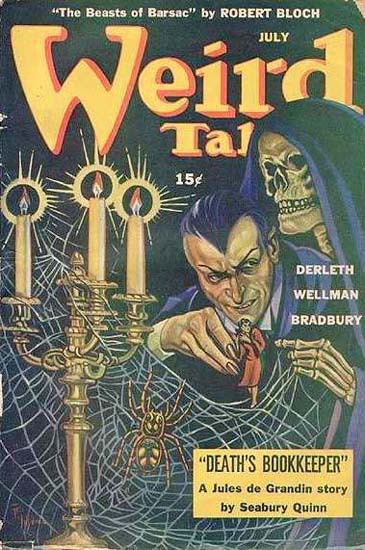 Mrs. Veal made another apparition in Weird Tales in December 1926. The magazine would have been on the newsstand at about the time H.P. Lovecraft was working on "The Call of Cthulhu." Although the story may not have influenced Lovecraft in his work, it may have given him some affirmation that the journalistic approach he had taken was the right one. Reading Milton and other poets from the 17th and 18th centuries makes it easy to see where Lovecraft got his inspiration. Lovecraft may even have imagined himself as the poem's personified "loathed Melancholy." That's not Howard's Cimmeria by the way, but Homer's. "De Foe in the Pillory," an engraving by J.C. Armytage. How could I pass up a beautifully made work like this one, showing an author from Weird Tales being pilloried? Defoe wasn't the only one. Milton was clapped into prison late in life for his support of the Revolution. Here is the frontispiece and title page of his Poems. If you leave out Sir Thomas More's translation of "The Sorcerer's Apprentice," Weird Tales printed only six other works from the Renaissance by my count. 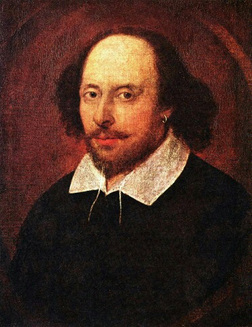 All were by William Shakespeare, two poems and four excerpts from his plays. Those four excerpts were part of Virgil Finlay's poetry series, which ran from December 1937 to May 1940. 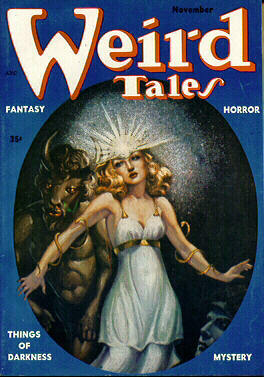 The series came to an end with Dorothy McIlwraith's assumption of the editorship of Weird Tales. Ghosts? Witches? Monsters? Murderers? 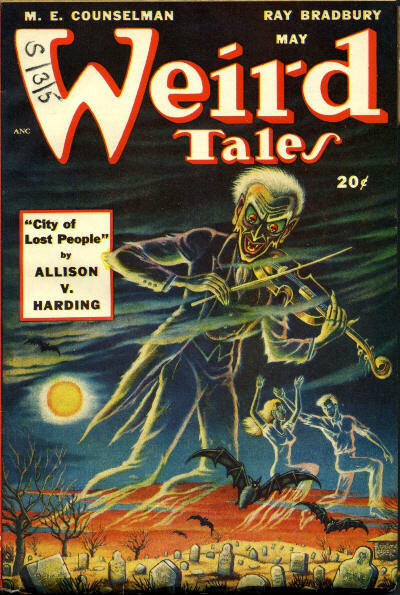 The Bard of Avon was also a teller of weird tales. A prolific author and esteemed editor, Harriet Alma Bradfield lived a tragically short life and died alone in her New York home. Born in La Crosse, Wisconsin, on April 13, 1899, she graduated from the University of Wisconsin in Madison in 1920. Shortly thereafter, Harriet moved to New York and received a certificate of secretarial studies from Columbia University during 1923-1924. Whether she returned to her hometown is unknown, but by 1930, Harriet Bradfield was a permanent resident of New York City. In an August 1930 article in The Author and Journalist, Harriet was described as an editor "you want to know." 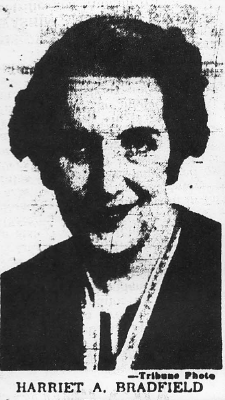 She worked at various publications before becoming a columnist and market letter editor with The Writer's Digest in 1932. She spent the rest of her career with that publication and wrote prolifically for romance pulps, including All Story Love Stories, Love Fiction Monthly, Ten-Story Love (whose characters no doubt reached heights of rapture and ecstasy), and other titles. All of her published works appear to have been either non-fiction or romance except for the six poems she sold to Weird Tales between 1948 and 1953. The last, "Suspicion," was published posthumously. Harriet A. Bradfield died on March 16, 1953, at age fifty-three. If you can find it, I can't think of a source with a more intriguing title than "Editors You Want to Know: Harriet Bradfield" by B. Virginia Lee in The Author and Journalist, August 1930. The cover of Weird Tales for November 1953, the last issue in which a poem by Harriet A. Bradfield appeared. It was also the last cover by Margaret Brundage and was recycled from January 1945 when it illustrated Edmond Hamilton's "Priestess of the Labyrinth." It's worth noting that most of these works came early in the tenure of a given editor. An editor pressed for time and in need of content might easily turn to his or her own work or the work of friends or associates. Lucian is a figure from the ancient world, known for his comic and satiric works. His True Story or True History is the earliest known work involving a trip into outer space, encounters with alien life forms, and interplanetary warfare. The story is often cited as the first science fiction novel. Lucian's Philopseudes ("Lover of Lies") is the source of "The Sorcerer's Apprentice," reprinted by Weird Tales in a translation by Sir Thomas More (1478-1535) in its October issue, 1939. Lucian's original work is also the inspiration for Goethe's well-known ballad, written in 1797. According to Wikipedia, a line from the poem, "The spirit that I called," has become a cliché, referring to an ally that, once summoned, cannot be controlled. In the early 1930s, Adolf Hitler rose to power and was appointed as chancellor of Germany. Goethe's ideal of a Germany made up of separate principalities was long gone, while the Weimar Republic, which originated in a city bearing his unequalled cachet in German culture, became the first nation to fall to Hitler and his Nazi Party. Hitler--the spirit that was called by the German government and people--of course went out of its control and launched a war in Europe in September 1939, a month ahead of the cover date of Weird Tales in which Lucian's story appeared. A year and a month later, Walt Disney's Fantasia made its debut in a New York theater. 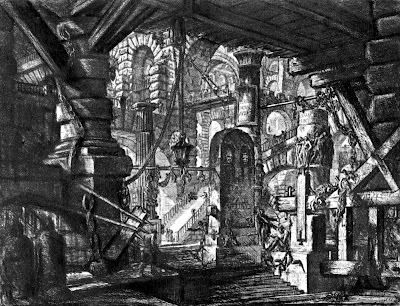 One of the highlights of the film is a segment animating Paul Dukas' symphonic poem, "The Sorcerer's Apprentice" (1897), after Goethe's poem from a century before. 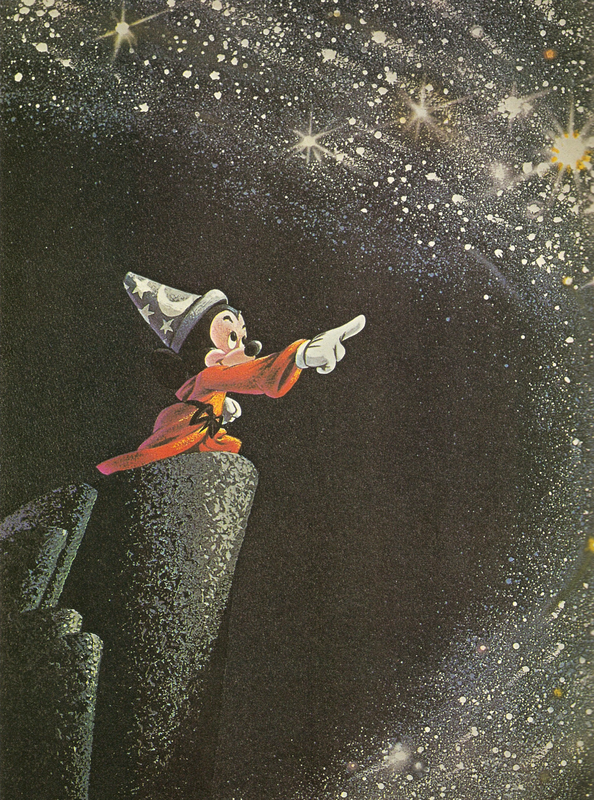 The star of "The Sorcerer's Apprentice" (the Disney version) is of course Mickey Mouse. Helen Liello, daughter of a clerk and farmer, was born Helen A. Green on November 9, 1879, in Bergen, New Jersey. In 1900, she was living in Thompson, Connecticut, with her widowed father, her sister, and her cousin, Clarence Ward. By 1910, she was boarding in Brooklyn and studying music. That was probably the last time a federal census taker found her living in the United States, for she had by 1920 married and begun her travels abroad. Helen Liello came by her Italian last name by marrying Giuseppe John Liello (1892-1967). Born in Stromboli, Italy, Liello emigrated to the United States in 1901. Settling in Brooklyn, he became a naturalized citizen in September 1919. 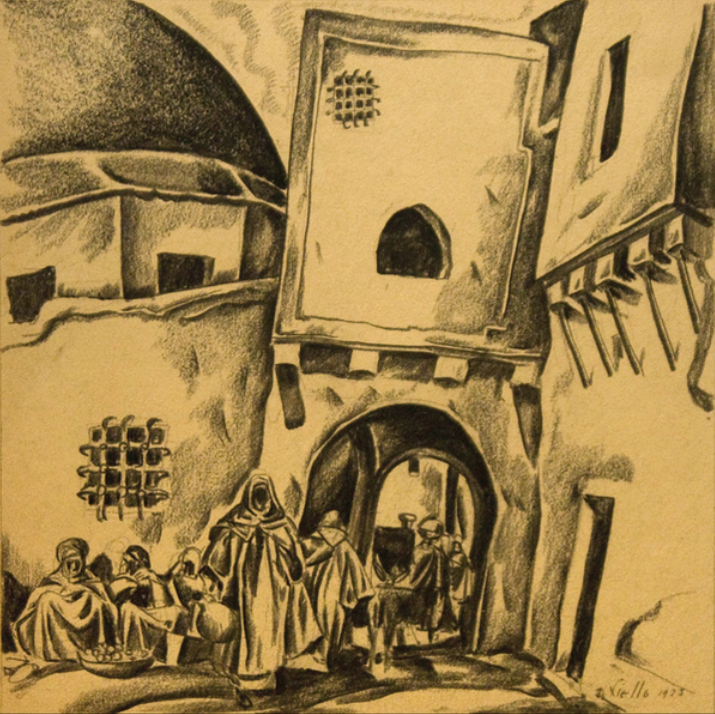 A budding painter and graphic artist, Liello studied at the Art Students League and applied for a passport in October 1919--only weeks after becoming a citizen--so that he could study art in Holland and France. With him on that trip was his wife, Helen A. Green Liello. The couple would travel to Europe many more times over the next decade. During that time, Helen Liello wrote. 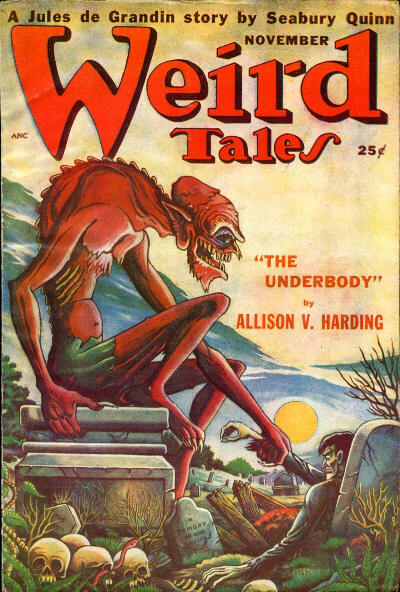 Weird Tales was one of her markets. She sold just one story to the magazine, "For Sale, A Country Seat," printed in the February 1925 issue. (1) Also during the 1920s, she wrote for Young's Realistic Stories Magazine and Breezy Stories, later for The Yellow Book. 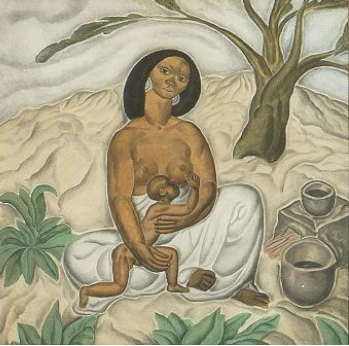 Many of her husband's works, created in Europe and Africa, date from the same period. Over the course of her long life, Helen Liello corresponded with her cousin, Clarence Ward (1884-1973). Born in Brooklyn, Ward earned three degrees from Princeton University (the last in 1914) before landing a position in the art department of Oberlin College. In his three decades at Oberlin, Ward built an impressive résumé: teacher, architect, pastor, founder of the art library, chair of the art department, and director of the Allen Memorial Art Museum. Ward retired in 1947, yet Oberlin College still remembers him with its Annual Clarence Ward Birthday Party and Student Exhibition. A noteworthy artist and a member of the Society of Independent Artists, John Liello died in Florida in April 1967. His last residence was Altamonte Springs. Less than a year later, on March 2, 1868, Helen Liello passed away in Naples, Italy, where she had lived for many years. She was eighty-eight years old. Burial was at the British Cemetery in Naples. Helen Liello's correspondence with her cousin Clarence Ward is in the collections of Oberlin College. (1) The 1925 New York State Census, ostensibly dated June 1, 1925, has John and Helen Liello residing at 261 West 22nd Street, New York. He was an artist, she was a writer. 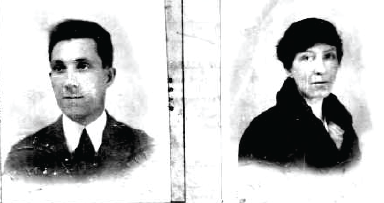 Giuseppe John Liello and Helen Liello, passport photographs, 1919. Symbolically or not, they are turned away from each other. Did they separate or divorce in later years? Rue Tourbet-El-Bey, Tunis (1923), a charcoal drawing by John Liello. Another work by Liello, from Africa. Postscript (Dec. 6, 2012): A family member writes that Giuseppe John Liello and Helen Green Liello were indeed divorced and that she returned from overseas, to Brooklyn, and alone, dates unknown. He remarried after that. Thanks to Randal Everts for locating Helen Green's birth record. Thanks to Alan Husby for a correction to publication dates. Watchmen and "The Call of Cthulhu"